While out on road trips, I have the tendency to drive the side streets of the towns along the way. Here are three interesting places that I have come across while wandering the streets of Globe and Miami. This interesting machine is parked on a siding at the north end of Globe. I do not know the crane's history, or who owns it. It is not a part of a museum display.The car appears to have been sitting on this siding for quite a while. At the time, all I could say about the car was that it was a crane of some kind. The lifting machiney looked to be very complete. 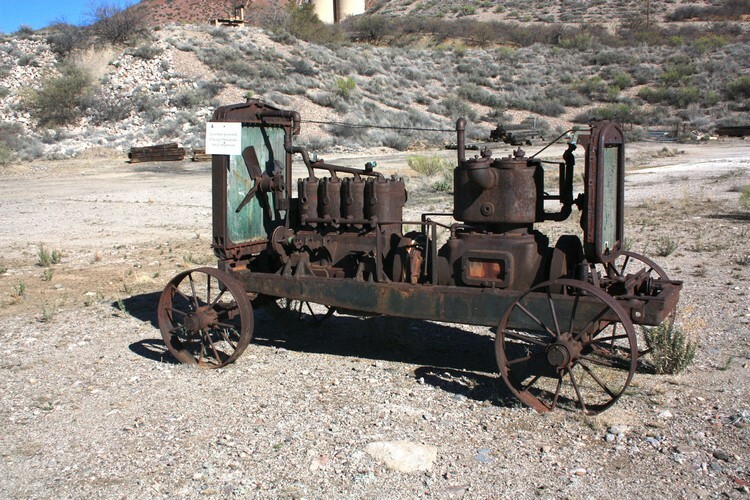 The vertical piston on the side of the hoisting machinery gave it away that this was a steam powered machine. The large can shaped structure at the rear of the cab had to be the boiler. The crane operator who worked next to that boiler must have been one tough guy. The machine was manufactured by the Brown Hoisting Machinery Company. The name is prominently displayed in several places on the car. An online look-up of the company name revealed that "The Brown Hoisting Machinery Company" name was in use from 1900-1927. This photo is from a 1919 Brown Hoisting Machinery Company catalog. The crane in the catalog photo looks very similar to the car in Globe. A catalog reference stated that the car could be outfitted with either coal, wood, or oil as the fuel for the steam boiler. 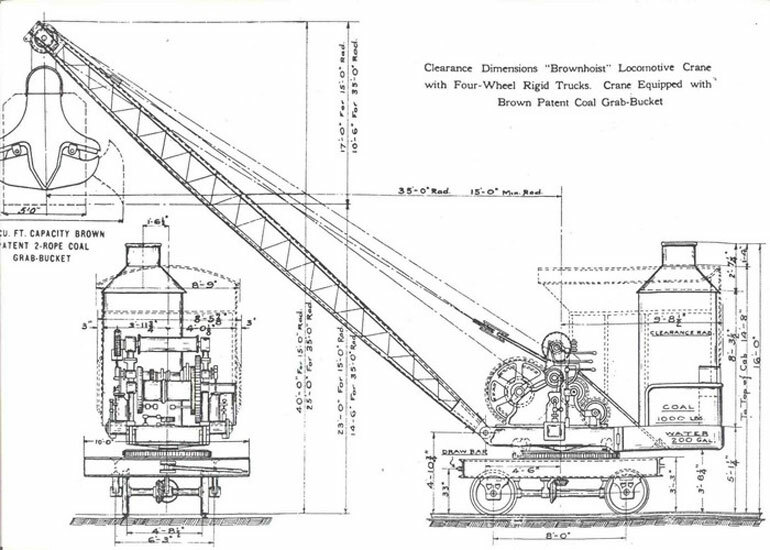 This working drawing of the locomotive crane shows that the machine was self-contained. There were on board provisions for water and coal for the boiler. The lifting capacity of the crane depended on the elevation of the boom. The more that the boom was raised, the heavier the load that could be lifted. This elevation was referred to as the "radius". The higher the boom, the smaller the radius. In this drawing, the radius was shown at 35'. The working radius for the car in Globe, with its 12000 pound counterweight, ranged from 12' and a lifting capacity of 31,500 pounds, to a radius of 39' and a lifting capacity of 7,200 pounds. I did not see outriggers on the car. My guess is that the lifting was done with an alignment as close as possible to the direction of the wheels. 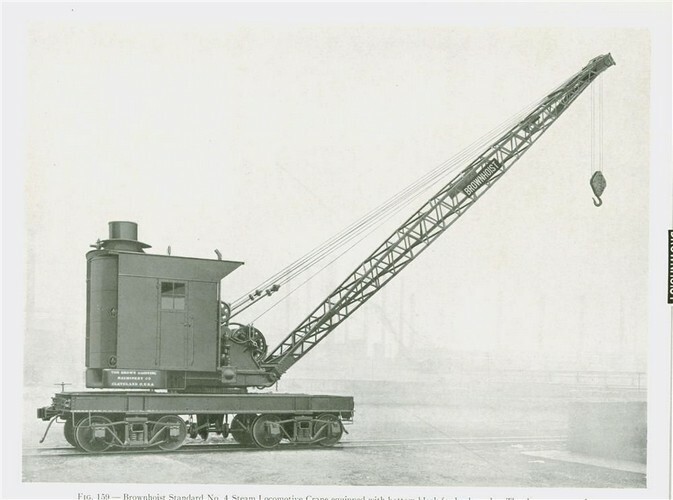 The locomotive cranes were designed to be used for all types of lifting work associated with railroading. They were used in bridge and trestle construction. Outfitted with a solid boom, the cranes could clear tracks of wrecked cars. 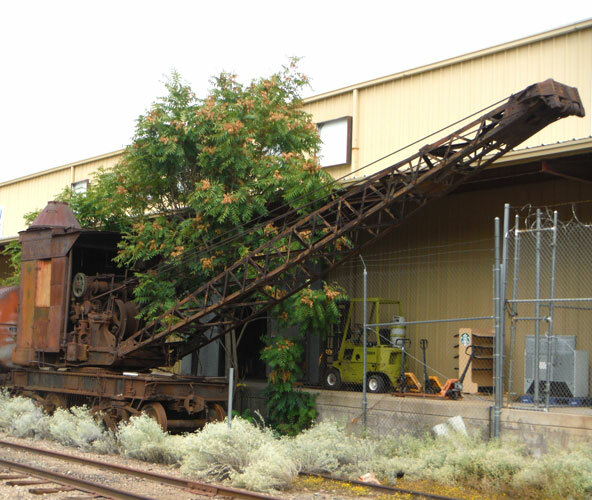 From another website, I learned that the Locomotive Crane Cars were actual locomotives. The power plant could be used to move the machine along the tracks. The locomotive crane could travel under its own power to the job site and return with one or two other cars attached. This place is located off a side street on the south side of Globe. 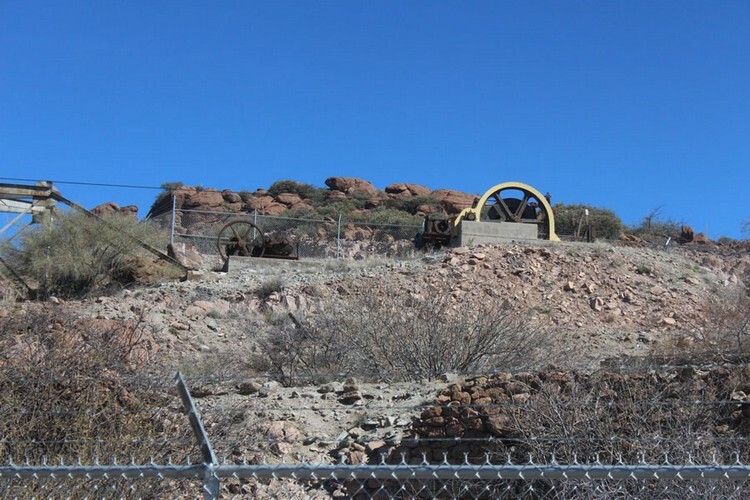 Local civic leaders and organizations have integrated a community park with the ruins, and the surviving equipment of one of the area's most important past producers of copper. There is a playground area, and picnic shelters. Walking trails loop out and around the old mine plant. 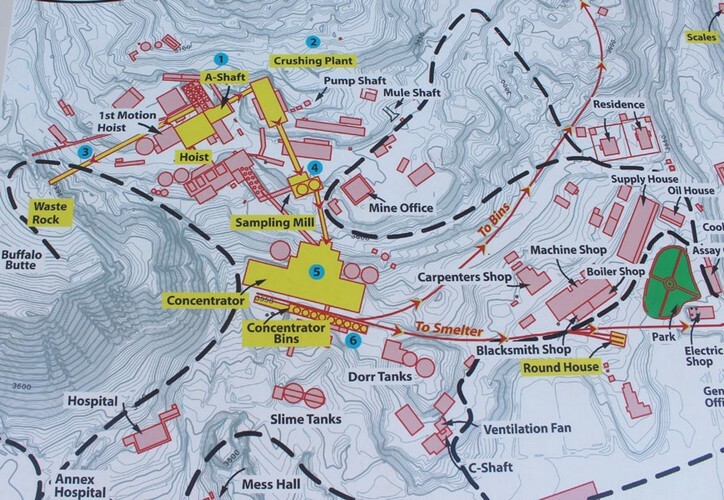 Where else can a person play a round of frisbee golf and then take a break to look over some old mine equipment and learn about the mining of copper? The purpose of the park appears to be to provide entertainment, relaxation and perhaps some education and appreciation of the area's mining heritage. What remains at the Old Dominion mine site is just a very tiny portion of what was there when the mine operation was operating at its peak. This map, which is on an interpretive sign along one of the trails, shows the development that was once at this location. This is a view from the trail below the two slime tanks shown on the map above. 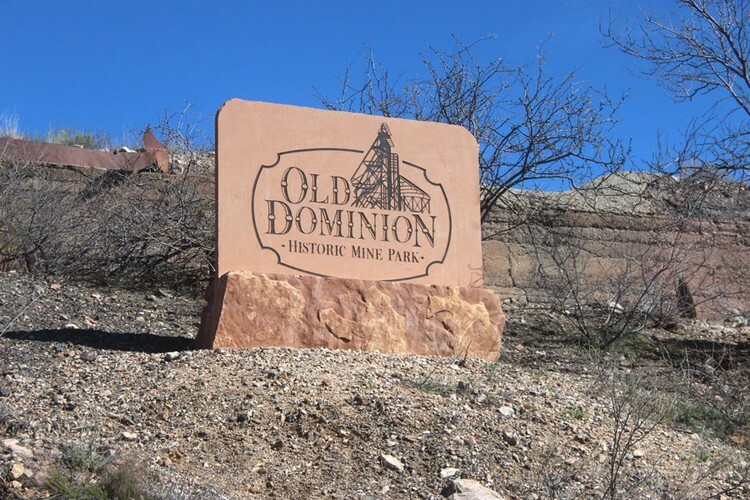 A large part of the ore processing at the Old Dominion Mine occurred on the hillside beyond those tanks. 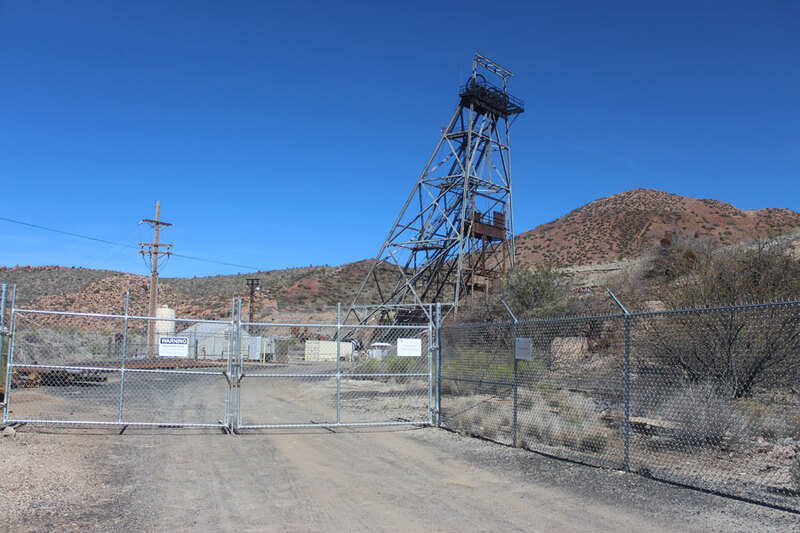 The metal headframe is standing over the A-shaft where ore was raised to the surface. The two tall vertical concrete cylinders were a part of the sampling mill identified on the map. The row of concrete foundations between the slime tanks and the tall vertical bins of the sampling mill were the concentrate bins which held the processed ore that was ready to be transported to the smelter. Neither the concentrator building or the other buildings that were once nearby still stand. The only building with walls is the ruin of the Mine Office. The foundations that remain are identified as to their former function. Visitors who have some sort of connection to the old mine operation, probably find this more interesting than the casual visitor. For me, the foundation to the electrical shop was no different than the foundation to the machine shop. However, if I was trying to find the location where my dad or granddad used to work, my level of interest would be entirely different. 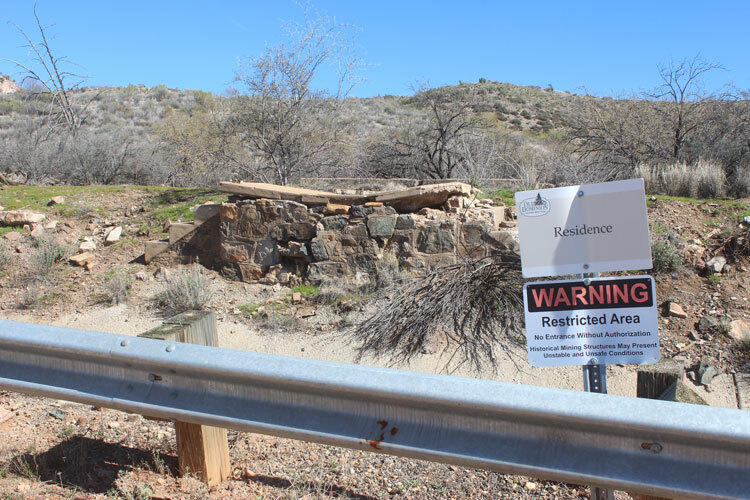 The park officials had to tread a fine line on how close to allow visitors to the old structures. The approach seems to be to allow visitors a close look, but not too close. Many of the structures are enclosed within tall chain link fences. In this case, I could hear the hum of a high voltage transformer coming from within the enclosure. After the mine closed down, water was pumped from the abandoned shafts to be used elsewhere. That process may be still ongoing. It is probably a good idea to keep people away from this area. With some careful maneuvering, it was possible to crop out some of the fencing from the photos. There appears to be somewhat more than three miles of trails(old roads?) that make their way around the park. Here one of the trails passes near the Sample Mill. The interpetive signs along the trails are pretty informative. 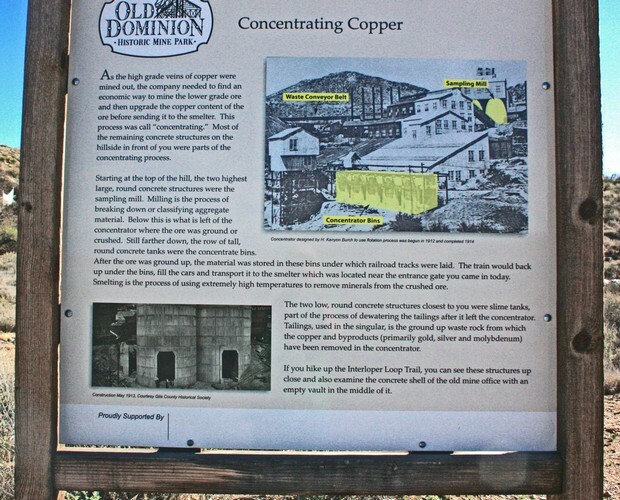 This one explained the concentrating process that was used at the Old Dominion Mine. For a larger version of this sign, click here. This old air compressor is an interesting part of the equipment display. The park is open daily from sunrise to sunset. On the day that I was there, there were families using the playground and picnic area. Other folks were getting in their walking exercise. And there were folks like me who were interested in the mining aspects of the park. I walked 1/2 to 2/3 of the available pathways. This facility is located in Miami in the old Bullion School building that was built in 1923. The center was created to showcase the cultural history of the Globe/Miami area. A variety of exhibits from the Slavic, Latino, and Native American communities note their contributions to the heritage of the area. Other displays range from local minerals to local kids who "did good" and went on to excel in public life on the national level. This is a photo of the Rose Mofford room. Rose Mofford was raised in Globe and went on to become Governor of Arizona. 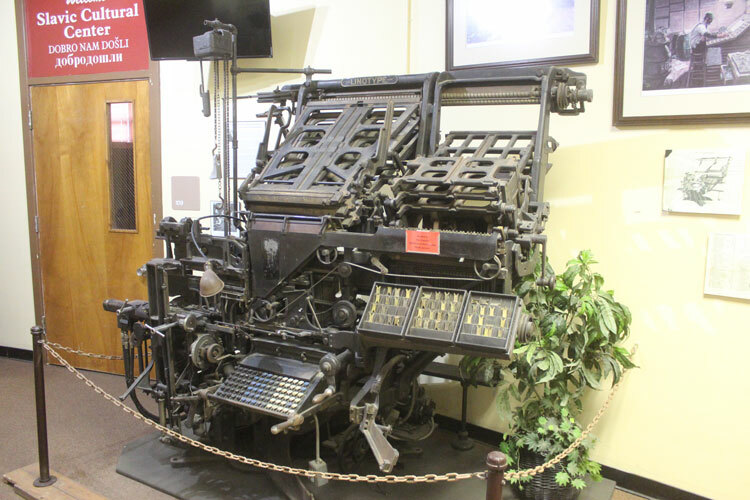 This linotype machine was once used by one of the newspapers in the area. 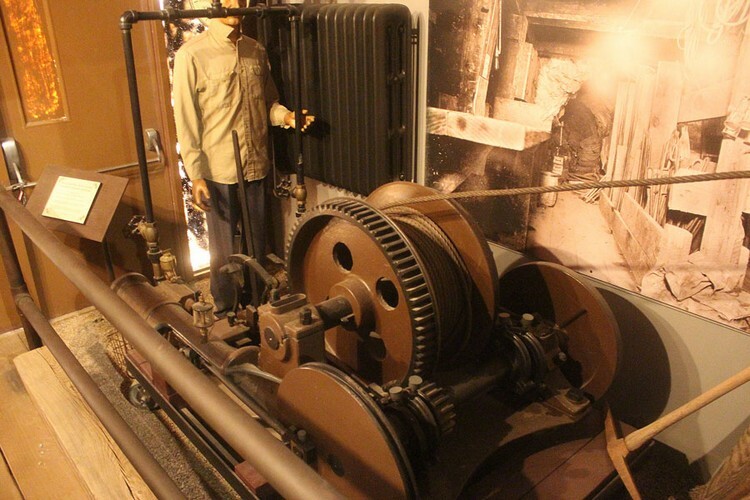 From the Mining area of the museum, there is this display of an old steam powered hoisting machine. This telephone booth looking structure was just that, a telephone booth. It was sound proofed to a very high degree so that telephone calls could be made in a very noisy mine environment. Is that horn mounted on the upper corner of the booth the ringer for the phone? This interesting display is of a Model A automobile that has been converted to an air compressor. Apparently, in the 1930's to 1950's, thousands of these conversions were done. This particular conversion was accomplished from a kit sold by the Smith Air Compressor Company in Kentucky. The conversion kit included a modified cylinder head. The engine ran on the outside two cylinders and pumped air from the middle two. There are other interesting displays from the early days of the local area--ranching, fire fighting, military influence and so forth. The museum is open on a limited schedule. When I was there, the days were Thursday through Sunday. I do not know whether seasonal adjustments are made to the operating schedule. Historical lectures and special events are conducted at the center. A schedule can be found at their Facebook page.